The Green Party launched its general election manifesto in London on Tuesday, demanding a “peaceful political revolution” to address climate change and bring an end to austerity. 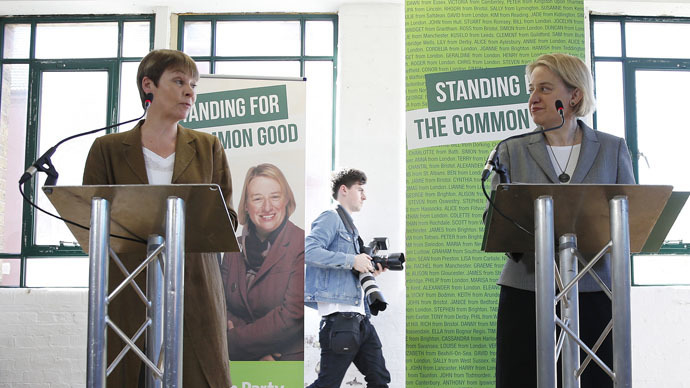 Party leader Natalie Bennett unveiled the 84-page manifesto with former-leader Caroline Lucas MP on Tuesday morning. The party’s manifesto, ‘For the Common Good’, spans the economy, the Israel-Palestine conflict, the NHS, climate change, education, the housing crisis, transport and more. It seeks to place environmental and economic sustainability at its heart. The Greens condemned Britain’s two-tiered economy, warning the Westminster Establishment has created a system that compounds inequality. It said the economy can only be transformed if the “vested interests” that create inequality are challenged and an ever-growing gap between rich and poor is closed. As a means of achieving this goal, the party pledged to end austerity, restore the public sector and create more than one million living wage jobs. The Green Party condemned Britain’s housing crisis, soaring rents, and rising levels of social cleansing. In a bid to tackle the nation’s housing crisis, the party pledged to scrap the bedroom tax, create 500,000 “social rented homes by 2020,” cap rents and introduce policies to protect renters. The Greens said the NHS has been poisoned by competition, and is eroding gradually under the weight of privatization. They pledged to end the “creeping privatization of the NHS,” scrap the Health and Social Care Act 2012, campaign for a “publicly-funded, publicly-provided health service free at the point of use,” and make mental health a serious priority. The party also vowed to remove “the profit motive” from the NHS and restore a truly public health service that works for decades to come. The party warned governments must prioritize real action on climate change if economic, social and environmental devastation are to be avoided. It suggested a rapid transition to a “zero-carbon sustainable economy” would create millions of new jobs and secure a safer climate for generations to come. The party pledged to “take urgent actions against climate change” and work with other nations in a bid to keep global temperatures down. It said it would outlaw fracking, phase out dependency on coal and reject nuclear energy. It also vowed to invest in the development of renewable energy, insulation and flood defenses. On the question of the Israel-Palestine situation, the party said it seeks a “just, sustainable and peaceful” solution. It insisted such a solution hinges upon mutual recognition of Israeli and Palestinian rights to independent statehood. The party condemned human rights violations committed by the Israel Defense Force (IDF) and Hamas, and was particularly critical the IDF’s oppression of and disproportionate use of aggression against Gazans. It said it would seek to suspend the EU’s trade deal with Israel. Britain’s Trade Union Congress (TUC) previously backed calls for the trade agreement’s suspension, which was signed in 1995, and is estimated to be worth over £1 billion. On the subject of education, the Green Party noted Britain has “world-class universities, brilliant teachers and talented students.” However, it said that “running schools as businesses and making them exam factories” wastes children’s potential and stifles creativity. The party contrasted Britain’s education system with that of Finland’s. It noted student debt in Britain is expected to reach £100 billion in 2018, while comprehensive schools in Finland managed by local authorities leave young people with no debt and are considered excellent. The party pledged to do away with university fees, invest in further education and reverse cuts. It also vowed to promote a comprehensive system of local schooling like that of Finland’s, and integrate academies and free schools into the local authority system. On the question of transport, the party said Britain requires “proper public transport” that is affordable and reliable. It promised to renationalize the railways, cut the cost of fares by 10 percent and promote walking and cycling to help lower pollution. While the Green Party’s manifesto is laden with alluring promises for pensioners, working people, environmental advocates and those who seek an alternative to austerity, some critics say the party must clarify further how it plans to finance these changes. The Green Party is fielding a total of 571 candidates on May 7. Current polls indicate the Greens have roughly 7 percent of the vote – a similar proportion to Nick Clegg’s Liberal Democrats. This marks significant progress since 2010 when the party secured a mere 1 percent of the vote. The Greens are expected to play a significant role in May’s election, as the party has attracted a proportion of disaffected Labour voters. Should they manage to take enough votes from Labour, they could potentially prevent Ed Miliband’s party from winning seats contested by the Liberal Democrats and Tories.